DETAILED ATTENTION: Ram MK Shrestha’s (second from right) morning meetings at Dhulikhel Hospital begin promptly at 8AM and set the tone for teamwork throughout the day. It is clear that this medical doctor, founder of a world class district hospital that serves as a model for affordable medical care in Nepal, is a philosopher who is also a do-er. Shrestha was born in Dhulikhel, was sent by a benefactor to Austria, struggled with language and culture shock to become a doctor. But unlike most other Nepalis, he decided to return to build a health care and education system in his home district of Kavre. This week, Shrestha was beaming with pride as he sat on stage with Prime Minister Sushil Koirala at the graduation of another batch of students from Kathmandu University where he is also vice-chancellor. Dhulikhel Hospital and the KU College of Medical Sciences now provide care to 550,000 patients a year from Kavre and surrounding districts with over 22,000 surgeries and 3,000 deliveries – all this for only Rs 25 per patient, Rs 250 a day for hospitalisation and no surgery costs more than Rs 25,000. It is rare in Nepal to see someone like this who walks the talk, a man of work not words. He rarely gives personal interviews, but encourages the media to focus on how his hospital runs so that the model can be replicated elsewhere. Shrestha’s office exudes the man’s simplicity, good taste and attention to detail. It is bright and open, minimally furnished, with a simple table, an indoor plant and a painting on the wall of a rural home. The carpet is a Nepali straw sukul. The ambience here is vastly different from over-staffed government offices piled high with dusty files where people are mostly chatting and sipping chiya. Indeed, it is mainly due to Shrestha’s commitment and drive that Dhulikhel today has the highest density of academics and professionals in Nepal, it has become the epicentre of higher education in the country. “Nepalis are not lazy, they are the hardest working people I know and I have been all over the world,” says Shrestha with a slight German accent in his English, “we just need to be given the opportunity to show what we can do.” For Shrestha, having one simple idea that can be implemented is better than having too many plans and thinking about them. Dhulikhel Hospital started from a two-room community hospice to grow into what it is today, not as is commonly believed through foreign aid, but through sheer hard work. Shrestha is carrying on the pioneering work of Suresh Raj Sharma who set up Kathmandu University as a centre for excellence. His future plans are to expand Dhulikhel Hospital and its ties with Kathmandu University School of Medical Sciences. And now that Dhulikhel has become a major junction of two highways, to establish a trauma centre to deal with road accidents. Shrestha’s day starts with a 8AM meeting at the hospital where the staff talk about their cases from the day before, so there is peer evaluation of treatment and care. It sets the tone for the day, and Shrestha usually has a guest or two who can inspire his staff. Shrestha says even more important than skills and training is the motivation of staff, and to keep commitment levels up, proper internal communication is essential. The secret of his management style is to build teamwork by letting everyone know what the others are doing. Motivated staff means patients are also well cared for. 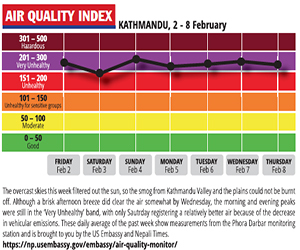 Dhulikhel Hospital has earned a reputation for treating rich and poor the same way. While touring the maternity ward, visitors are struck by the contrast to the filth and noise of other hospitals in Nepal. “A good hospital is one where you don’t hear even a newborn baby cry because the environment is comfortable and relaxed,” Shrestha quips. When he was prime minister, Pushpa Kamal Dahal visited Dhulikhel Hospital where he heaped public praise on Shrestha’s work. Shrestha told him: “Comrade, you call yourself a communist, but we are the real communists.” The room burst into laughter. Despite the current scandal about granting affiliation to new medical colleges, Kathmandu University is working with Devdaha Medical College and Birat Medical College to extend its medical training, administration and course content. 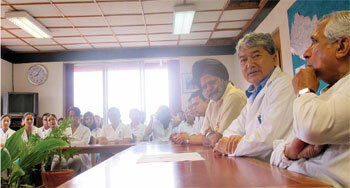 “Demand for medical care is growing, we need to expand and it’s a win-win situation,” says Shrestha.